Many families are pleasantly surprised that within a few days the kids are used to the new routine: they are attached to cuddle time, not the sippy! It supports the child’s appetite and emotional needs to bring the sippy or bottle into the routine, phasing it out rather than going cold turkey. 2. Incorporate supplements into meal and snack time to continue to support nutrition (if needed) as your child learns to enjoy other foods. Supplement drinks, or smoothies (even green ones) are food and can dampen appetite if given between meals and snacks. 3. Establish a real routine. While Nathan’s day had a rhythm to it, their “routine” of meals and snacks turned into “grazing.” They spent far too long (six hours a day) at the table or with food, hoping Nathan would eat a few more bites. With an hour or less between eating opportunities and a little something in his tummy most of the day, he had no chance to properly develop an appetite. 5. Stop ineffective rewards, bribes, and praise. 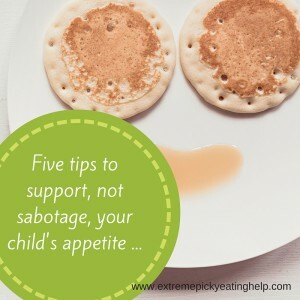 Many parents realize that force-feeding, yelling, or punishing doesn’t help a child’s appetite, but even praise and rewards backfire with many kids. Elise was encouraged to stop offering or holding food to Nathan’s lips. Her observations that Nathan has branched out on his own terms, and that the bribes and rewards were becoming less effective helped her abandon those practices. (One of our favorite quotes from Kerzner et al reinforces her hunch about the coercive tactics she has tried: “These practices initially appear effective, but become counterproductive, resulting in poor adjustment of energy intake, consumption of fewer fruits and vegetables, and a greater risk of under- or overweight.” ) We encouraged Mom to sit and eat with Nathan, and to allow him to be a participant at mealtimes, not the focus. Within a few days of Mom shortening the time at the table, removing pressure and distractions, decreasing mealtimes, offering Pediasure only with the afternoon snack, and having the morning milk with breakfast, Nathan ate a larger than usual breakfast and even said “I’m hungry” for the first time! While many parents are told that their child can’t feel hunger, in reality the child may not have been given an opportunity to develop hunger and learn to sense and respond to hunger cues. 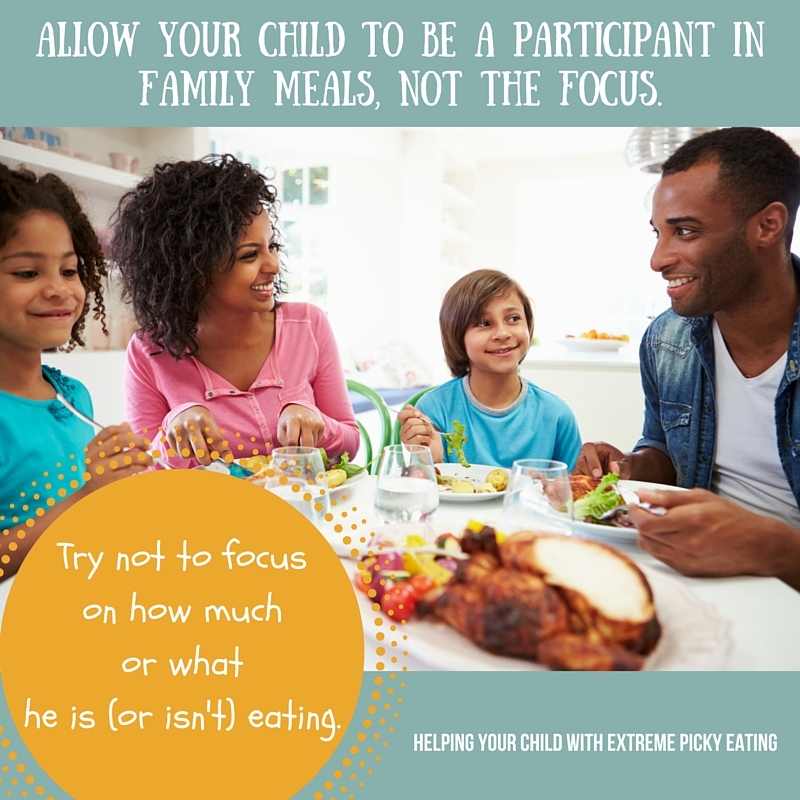 There are many ways parents can support a child’s ability to tune in to hunger and fullness cues, and to their curiosity around trying new foods. * This information is general advice and not meant to replace careful monitoring by a health care team. Medical and functional issues must be addressed and parents of a child with marginal nutritional status must be supported and followed closely. 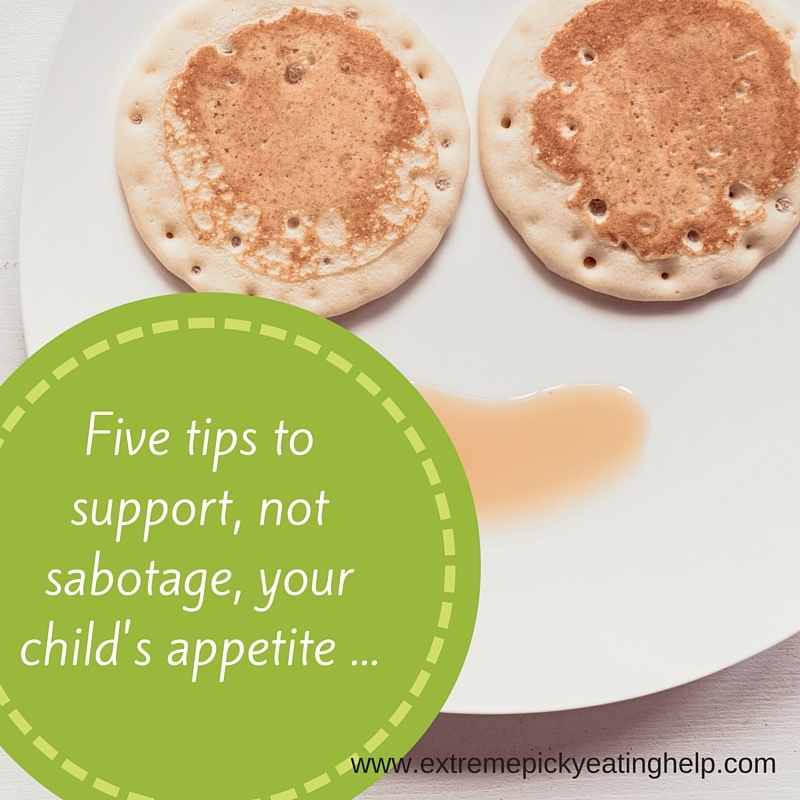 Nathan’s story is excerpted from our book, Helping Your Child with Extreme Picky Eating chapter on routine.